When I was a child, my two great-aunts, wives of King Rama VI, were still very much alive. We would often go and visit them on a Sunday afternoon. They had many stories to tell about life at court —some of them quite scurrilous by today's standards — but most of all they told of a time devoted to music and drama and poetry, where every day someone was putting on a production at court. 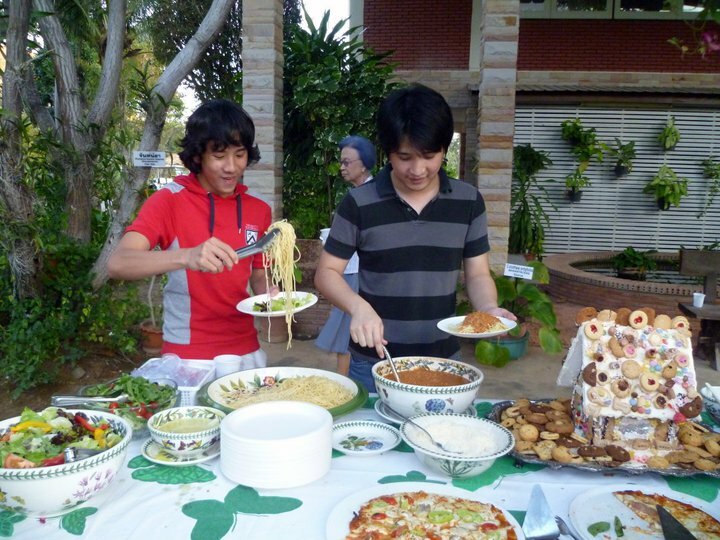 Ten years later we were invited to bring the kids of the Siam Sinfonietta to another palace that was a residence of my great-aunt, the seaside palace of Mrigadayavan in Hua Hin. When we arrived I had the opportunity to stroll through the "women's quarters" which would in those days have been absolutely forbidden to any male except the king himself, and to see the room she slept in, including a pink dress she once wore, laid out, the mosquito netting spread over her bed, and a wedding photograph on the dressing-table. It was a very strange feeling; I could hear her voice in my head. The last time I ever spoke to her was at the funeral of my great-great-aunt, Indrasakdisachi's mother. In the midst of that spectacle Her Majesty my great-aunt said about me, "Watch out for that kid. He's not afraid of anyone!" Imagining her as a young woman in the baby-blue painted room wearing the pink flapper dress, I remembered the stories she and her sister, Phra Sucharitsuda the royal consort, used to tell me. Suddenly the palace was not an empty place but full of the sounds and colors of the 1920s. The concert took place in a royal hall that was open to the garden. There was a balcony where the king used to sit to watch the proceedings - often his own plays being performed with my great-aunts as some of the key players. So when we performed, when we rehearsed in that hall, it was like reliving that era. I think the feeling of magic infected all the kids as well. The Mrigadayavan Palace people put us up in some beautiful seaside cottages right there on the estate and there was swimming and beach play every morning. 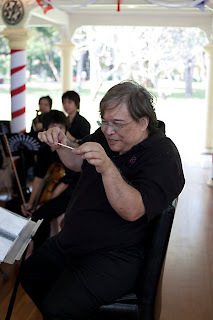 On the Saturday the kids played a Haydn, Rossini and Mozart programme ... sadly, the flute player's father passed away during the weekend and he had to run back to Bangkok. The concert was well attended and afterwards we had some wonderful rehearsal time to start getting into "Peter and the Wolf" and Mozart's 39th Symphony. 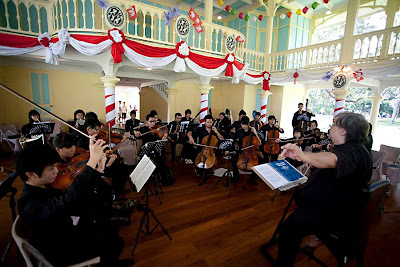 The next day we had a splendid mini-concert at another royal residence, the Chom Dong Villa which was a former home of HM Queen Rambhai Bharni, who was queen during the reign of Rama VII. The concert was accompanied by a lovely pizza dinner served from Chom Dong's huge outdoor pizza oven. Celebs there including Patravadi the well known Grand Dame of avant-garde theatre accompanied by the kids from the school she has founded for brilliant young theatre arts teenagers. 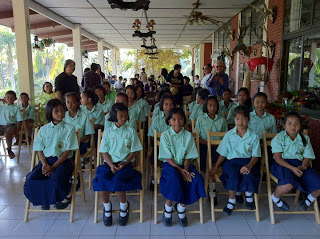 There were also about 50 kids from another local school who completely new to classical music, and that was fun as well. These are the kinds of events that make all this angst I go through worth while.